Essential Bliss, Issue #013 -- Essential Oils are the Natural Gift. Essential Oils are the Natural Gift - Scroll Down for the Feature Article. Welcome to the December edition of essential-oil-goddess.com e-zine which aims to provide you with fun and interesting information about using essential oils in everyday life. The "Bliss" oil blend of the month Christmas Spirit of course! Read on for more information. This month's exclusive offer for Essential Bliss readers is a gift voucher discount - read on for more details! Wishing you a Merry and Blissful Christmas! My book Lose Weight Peacefully is available now. You can order online at www.loseweightpeacefully.com and it will be delivered direct to your door, anywhere in the world. Are you thinking about starting another diet in the New Year? Is your New Year's Resoultion to lose weight? If you have ever wanted to honour your body, eat the food you love, and lose weight at the same time, then this book is for you. Essential Oil Support is an important part of this weight loss journey. Get your copy now to find out how. PS. Don't forget to subscribe to my monthly e-zine/newsletter The Peaceful Way at the website. Start Your Own Aromatherapy Home Business 7 important questions you must ask yourself before you start any natural health home business. Helichrysum Essential Oil for Psychic Development Also known as Everlasting or Immortelle, Helichrysum has an amazing ability to support psychic development. Come and say hi - I would love to see you! I will have plenty of essential oils to sample and my book for sale. I will also be doing a workshop demonstrating the Egyptian Emotional Clearing Technique and a seminar for Lose Weight Peacefully. See you there! Courses Australia wide and expanding! Adelaide course: Egyptian Emotional Clearing Technique 11-14 February 2009. Please contact me ASAP if you are interested. For all enquiries and bookings please call Jen on 0401 089 233 or contact me. This course will be held at Stafford Heights State School and Pine Rivers (Strathpine) State High School. You will learn how to make your own individualised essential oil perfume and take home two starter oils. For more information click here. This course will be held at Stafford Heights State School. Next course: 23 March 2010. Do you have a passion for natural health or contemporary therapies and want to start your own business? Not sure where or how to start? You will learn the answers to these questions and much more. For more information click here. Come and learn the latest in essential oil research and new essential oils not available anywhere else in the world. Young Living are the world leaders in essential oils. These seminars are at no cost. For all enquiries and bookings please call Jen on 0401 089 233 or contact me. As a qualified counsellor and aromatherapist, I am here to help with issues that are preventing you from moving forward in your life. If you feel ready to work with these issues many people report feeling "emotionally lighter" after a session. ...then working me, a qualified counsellor and aromatherapist may be just what you need. Exclusive to Essential Bliss readers, I am offering a 10% off all gift vouchers for treatments only. For more information about the services I offer click here. To order: Please call Jen on 0401 089 233 or please use this contact page. Pssst, you must mention the password "Gift" to receive this offer. Merry Christmas! It is that time of year where we think about giving to our loved ones and spending time with those we care about the most. This year I will be giving the gift of Young Living Therapeutic Grade Essential Oils. What makes these oils so special? I believe it is the fact I cannot deny is that my mood and feelings change for the better when I use these oils. Lavender essential oil - smells fantastic with cedarwood and provides a balance of male/female energies. Pepermint essential oil - we are doing some travelling over the holidays so this will keep him focussed on the road! V-6 Enhanced Vegetable Oil Complex - to add to any essential oils for an amazing massage. Contains coconut oil so it absorbs rapidly into the skin and he won't get all greasy. Orthosport Massage Oil - he is constantly on his BMX, skateboard or any other sport that takes his fancy at the time. He always has bumps and lumps and sore muscles from so much exercise! Highest Potential essential oil blend - to show him that he can be anything he wants to be! 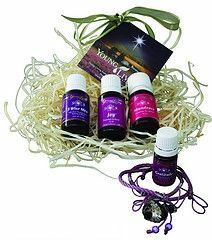 Christmas Oils Kit - contains the blends 3 Wise Men, Joy and Abundance - what more would you want to give a friend! There is also a bonus Gratitude and the most gorgeous glass bottle pendant for keeping her favourite essential oil with her at all times. What will you get your friends and family this year? Essential oils are natural, good for you and the environment and it says something special about caring for friends and family. Also, everytime they smell the oil, they will think of you! EXCLUSIVE: ESSENTIAL OIL CHRISTMAS BLENDS. Only for Essential Bliss readers. If applying to skin: Remember skin test first and only use therapeutic grade essential oils directly on the skin. DO NOT try this with any other oil. Please check with health care professional and/or consult the Essential Oils Desk Reference for safety information. PLEASE NOTE: I only use pure therapeutic grade essential oil from Young Living and the recipes above are based on Young Living Essential Oils. You can order from my store or contact me for more information. I am having fun on the World Wide Web and have just started a Facebook page. There is a fantastic website called Oil Testamonials. I highly recommend this website! You can search testimonials and you can even have a look at the testimonials I have added or join (free registration) and add your own testamonials. The Essential Oils Desk Reference states that Christmas Spirit is a "purifying blend of evergreen, citrus, and spice, reminiscent of winter holidays, that brings joy, peace, happiness and security." Christmas Spirit is the number one essential oil for Christmas time--of course! We know that essential oils are directly absorbed through the nerve receptors in our nose, and this has direct access to the limbic system of our brain--where all emotions and memories are stored. Make Christmas Spirit part of the joyous memory of Christmas time. You can use it any time you want an uplifting feeling. Possible skin sensitivity. Do not use on children younger than 18 months old. A beautiful oil to put into the diffuser on Christmas Day. I went through a bottle of it one Christmas! The name says it all and I can highly recommend it. Other ways to use Christmas Spirit is to use a couple of drops on a wet cloth in the clothes dryer, put a few drops in the vacuum cleaner bag, add to to clothes drawers and of course wear as a perfume. Enjoy!